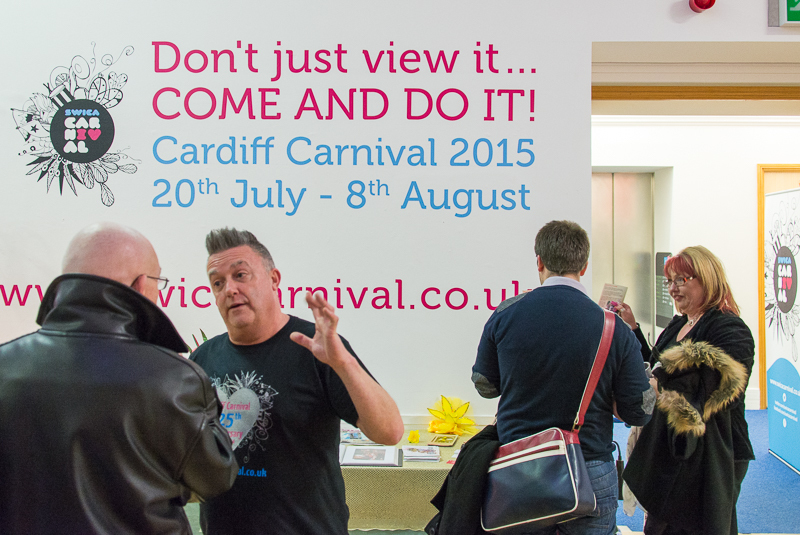 Based in Cardiff, SWICA Carnival (formerly South Wales International Carnival Arts) had a rich 20 year history of carnival and community art both in Cardiff and around Wales, but their branding was looking old and dated. 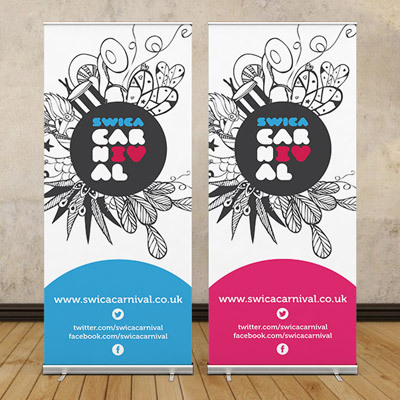 We were called in to rebrand the company in 2013, and as a result the company became SWICA Carnival. We first designed a suite of logos for the organisation (about 16 in all). 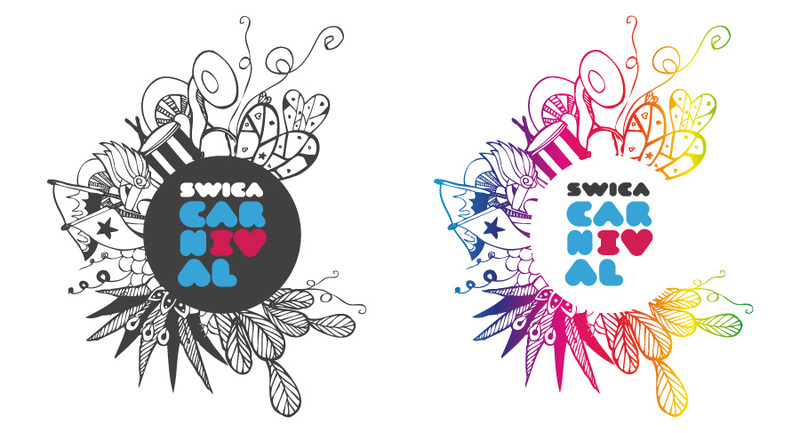 Following the success of the rebrand, we designed the new bilingual SWICA Carnival website, utilising new jQuery techniques to make 2 single page sites (drawing in content on demand from elsewhere). 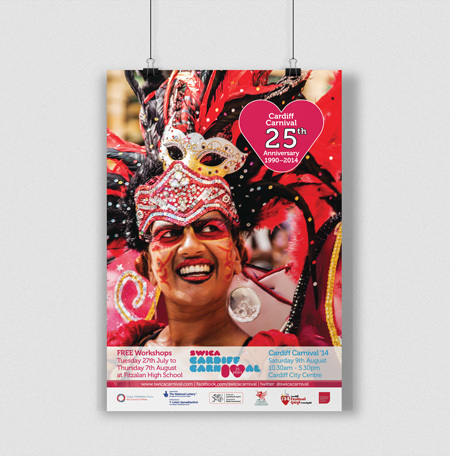 We later designed the 2013, 2014, 2015 and 25th Anniversary Cardiff Carnival brochure, posters and flyers, and press ads. 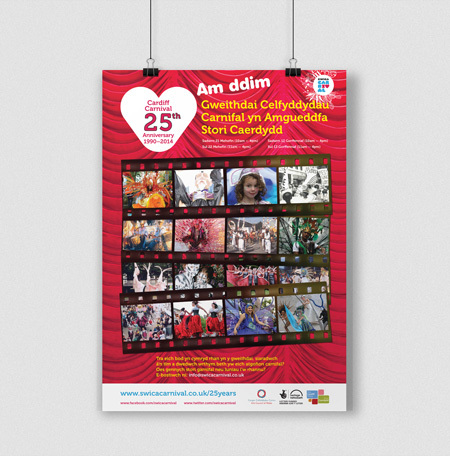 Finally we've designed a range of pop-up banners and 'feather' banners for use at outdoor events. "…response to you logo designs has been universally positive - without exception everyone I have shown it to has appreciated it! I still think its a real inspiration and pleasantly baffled u found something new but essential in the much logoised word 'carnival'!" 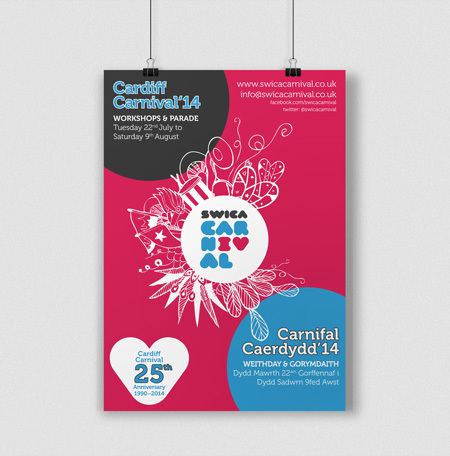 A range of the logo elements that we designed for SWICA. 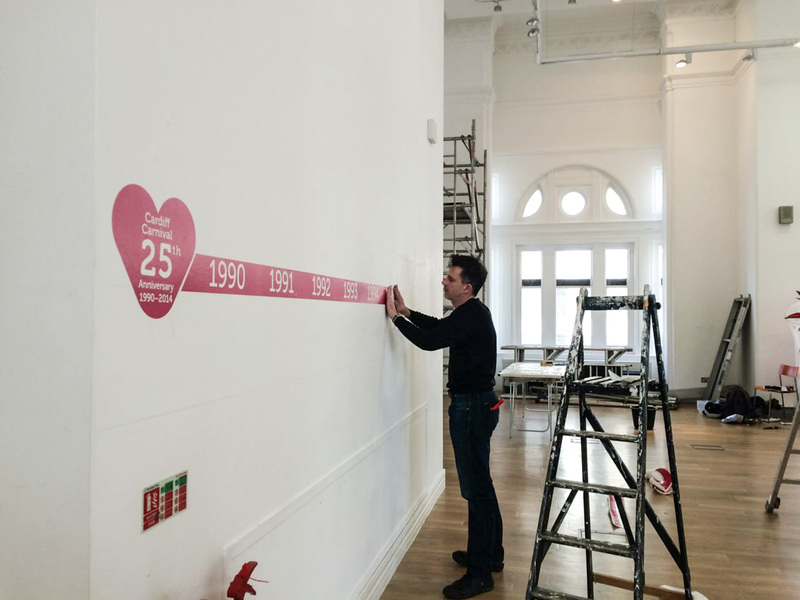 Our first task was to rebrand the organisation, which had been using the original logo designed in the early 1980s — and was really showing its age. Researching 'Carnival logos' was a bit depressing as they were mainly carnival masks and big tops (circus) with almost every logo using every colour in the palette. 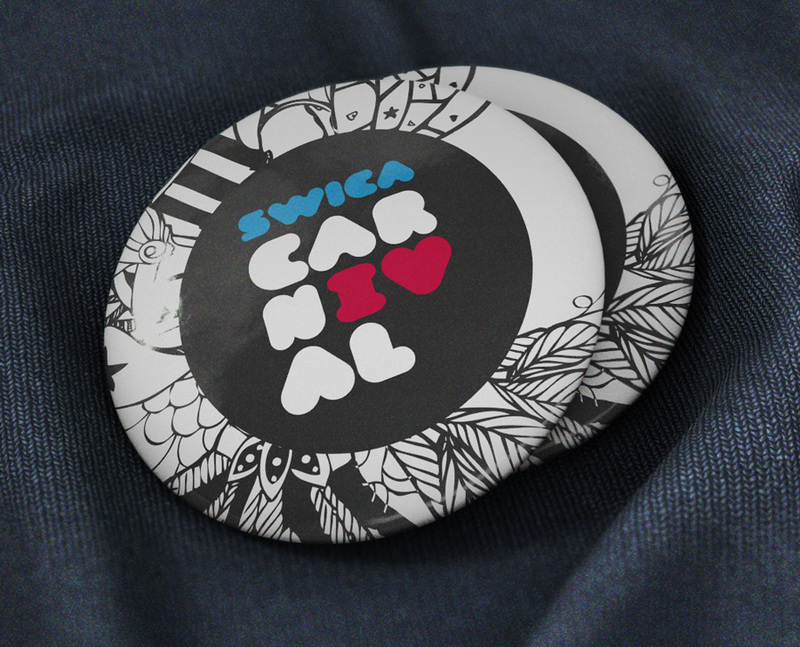 We (and SWICA) wanted to develop a logo which was eye-catching and stood out from the carnival logo crowd. 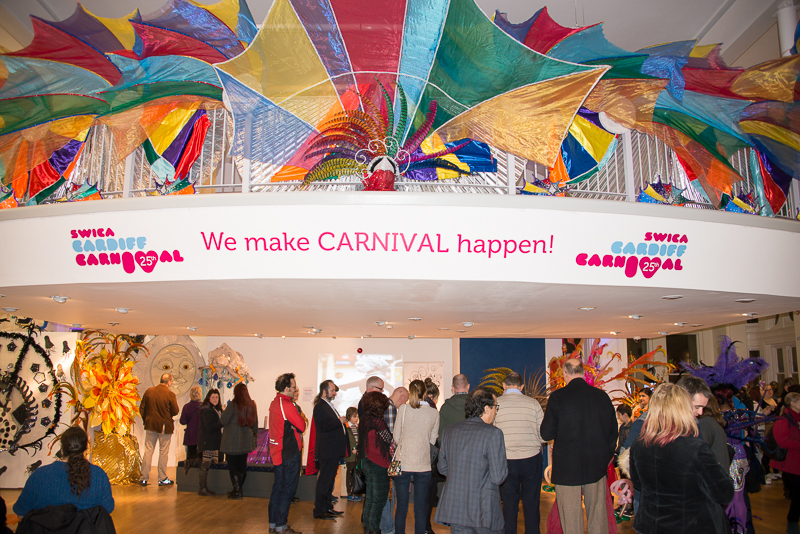 After much sketching and 'playing' we hit upon the fact that the 'IV' in Carnival could be turned into a 'I♥' whilst still reading as a V… with careful use of the typeface. We were please with the result and so was the client (read their testimonial left). 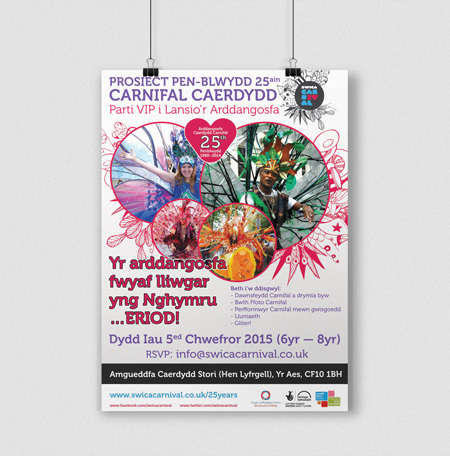 We wanted SWICAs bilingual site to be colourful and eye-catching, just like their carnival events. 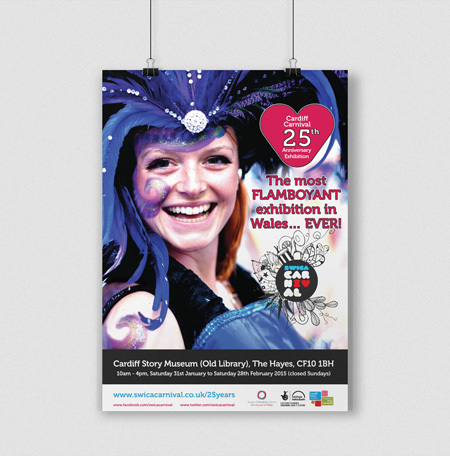 Rhys photographed a range of their colourful costume materials, sequins, feathers (etc) at their offices. 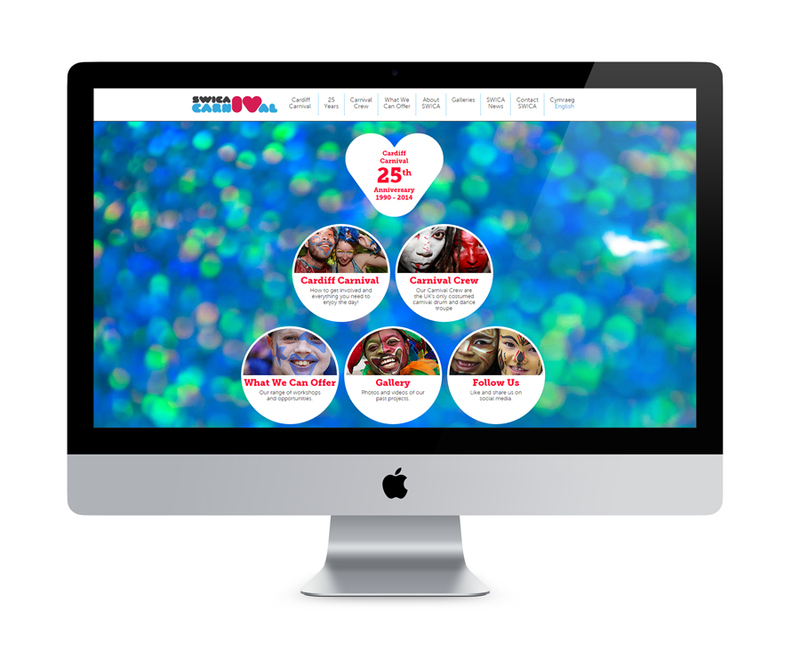 When the user views the website homepage, one of many such background images is chosen at random, varying the user experience for every visit — just like the carnival experiences that SWICA provide. 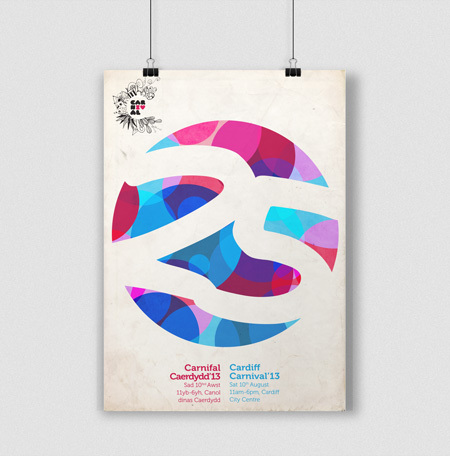 For the 25th anniversary we remixed the logo elements to create an 'XXV' (25). 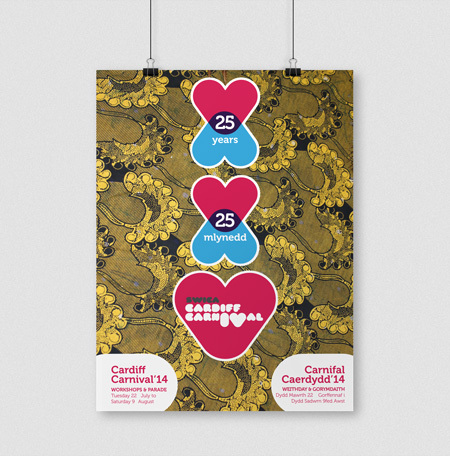 Twenty five years of carnival love. 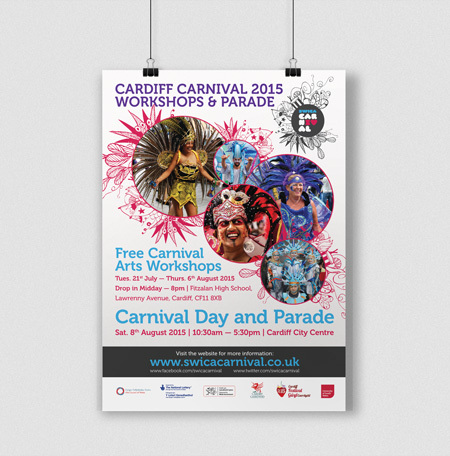 A range of the various posters that we've designed for SWICA Cardiff Carnival, or their pre-carnival workshop events. 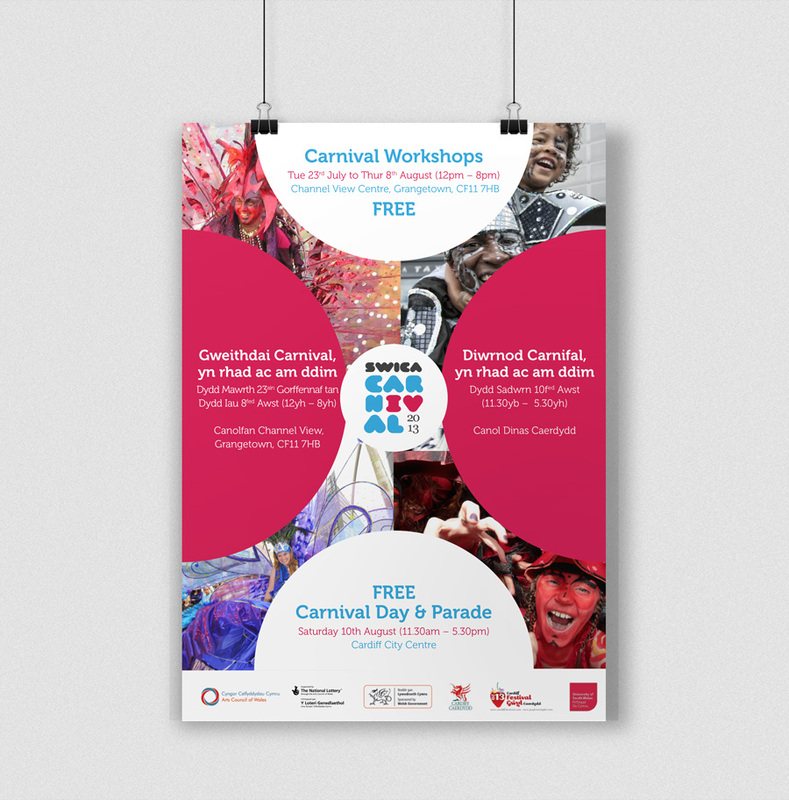 There are two distinct styles of poster at work here; one set aims to be as simple and eye-catching as possible, just using elements of the logo, whilst the other feature lots of images from past carnival events — which the client felt was important as they are an inclusive community organisation. 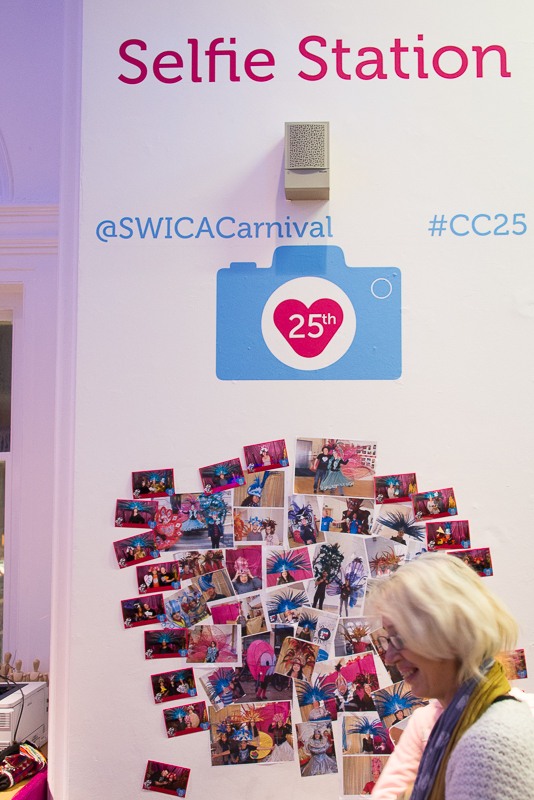 SWICA held a large exhibition to celebrate their 25th anniversary and asked Webber Design to come up with some ideas to decorate the venue. 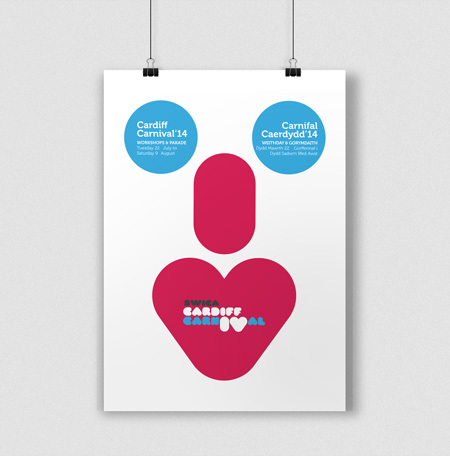 We developed, designed and applied a range of designs, all sticking to the simple colour palette of the branding.